http://www.line-stickers.com/ – Nabepaka: Celebrating 15 Years of Yum Line Sticker | Nyasia is celebrating 15 years of delicious food with a very special set of stickers! 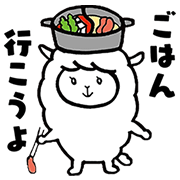 The alpaca featured in this set loves hot pots more than anything else in the world. He also knows how to be there for you when you need a good sticker! Friend Nyasia’s official account to get them. Available till July 20, 2015. Copyright : Copyright © 2015 REINS International Inc.
Next post Frappuccino- Sip Sip Go!